Happy Valentine’s Day everyone. 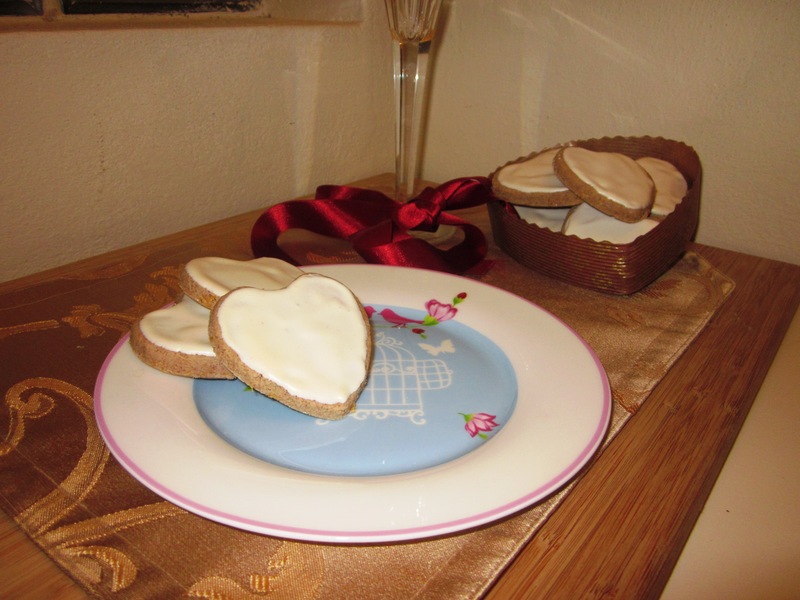 I wish I could actually give you all one of these cookies, they are delicious! I first saw the recipe the other week in the December (Christmas) issue of the BBC Good Food Magazine, which is the current issue here in Australia (we are always a few months behind in getting them). I always find new recipes I want to try in this magazine and I have just this week subscribed to the digital version of the magazine, so from now on I won’t have to wait months for the magazine to arrive in Australia. The magazine included a section on Christmas baking traditions from around the world, including the German Christmas cookie the Zimtsterne. As soon as I read the recipe I knew I had to make the cookies, but I couldn’t wait for Christmas 2014! 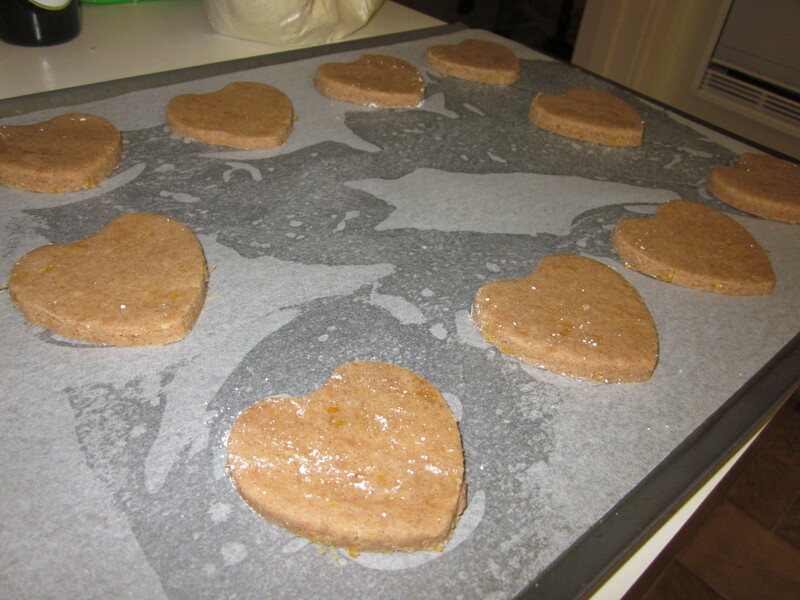 So instead I decided to use the recipe to make some heart shaped cookies for Valentine’s Day. The flavours are amazing. 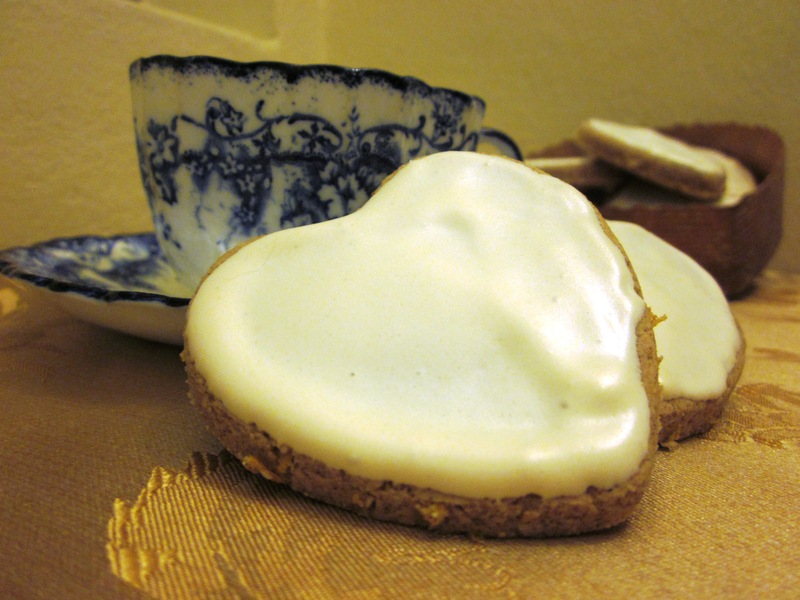 The ginger, cinnamon and lemon go so well together and the biscuit has a lovely nutty, spicy flavour without being overpowering, with the lemon providing some freshness. These are a chewy cookie, with the outside developing a delicate macaron like crispness and that are completely different to gingerbread biscuits. I certainly plan to make them for Christmas every year from now on! They also have the added bonus of being gluten free so they make a great alternative to gingerbread for anyone who can’t eat gluten. I shared the biscuits around at work and I think it was one of the most positive responses I’ve ever had. They were very popular. So if you are looking for a different cookie recipe to try, or maybe something different for next Christmas, I recommend giving these a go. 1. Preheat the oven to 130C fan forced (150C). Line a large baking tray with baking paper. 2. Place the two egg whites in a large clean bowl (not plastic) or the bowl of a stand mixer and whisk (using the whisk attachment on a stand mixer or an electric hand whisk) until it becomes foamy. Add the lemon juice at this stage and then whisk until the egg whites form soft peaks. 3. Once the egg whites have formed soft peaks, start adding the icing sugar in a spoon at a time until all the icing sugar has been added and the mixture is shiny and stiff. 4. Remove ¼ of the egg white/icing sugar mixture and keep in a separate bowl to use as the topping. 5. Add the almond meal, lemon zest, cinnamon and ginger to the rest of the egg white/icing sugar mix and mix to form a dough. It will be quite sticky. 6. The dough is best rolled out between baking paper as it is sticky. Place a sheet of baking paper on the bench. Dust a small amount of icing sugar onto the paper and place the dough on top of the paper. Dust the top of the dough lightly with icing sugar and then place another sheet of baking paper on top. 7. Roll out the dough to approximately 0.5cm in thickness. 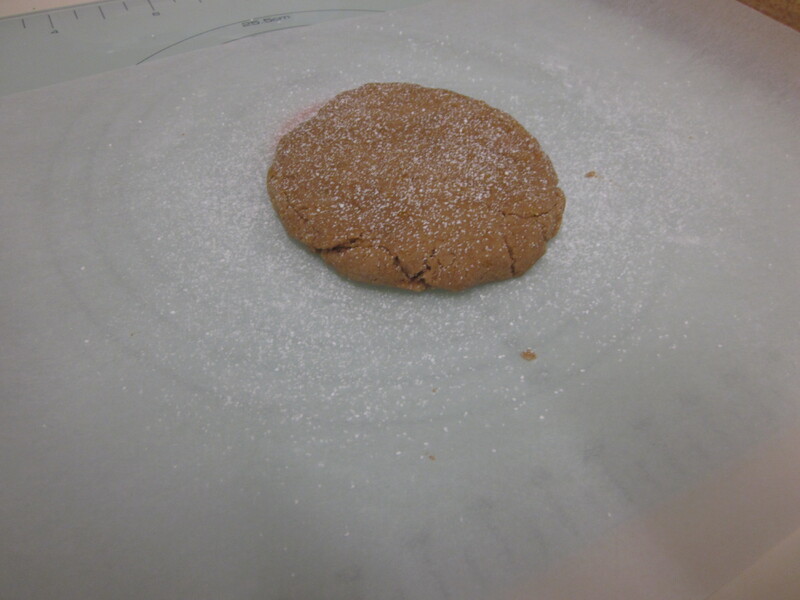 Peel off the top sheet of baking paper and cut out to the shape of your choice and place on the baking tray. Repeat until you have used all the dough. 8. Before baking, spread a small amount of the remaining egg white/icing sugar mix over the top of each cookie (either using the back of a small spoon or I used a small offset spatula). You may need to add a few drops of water to thin it out slightly if it is too stiff. They got a bit neater with practice! 9. Bake in the oven for 12-15 minutes for the smaller stars. My cookies were a bit larger and took 15-20 minutes. You want to bake them until the icing on top has set but isn’t browning. Allow them to cool fully before storing in a sealed container. They will last for up to 2 weeks. The late night baking sessions were a bit much, as was the burn that was the result of my tired clumsiness (I still have the scar), so I promised myself I would do less this year. 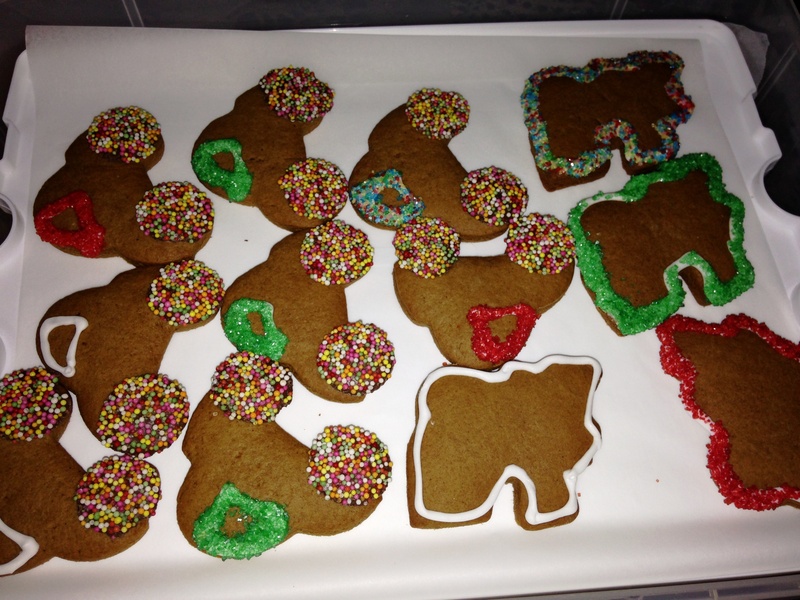 That lasted right up until we were asked to do a morning tea display challenge for our Christmas morning tea at work. 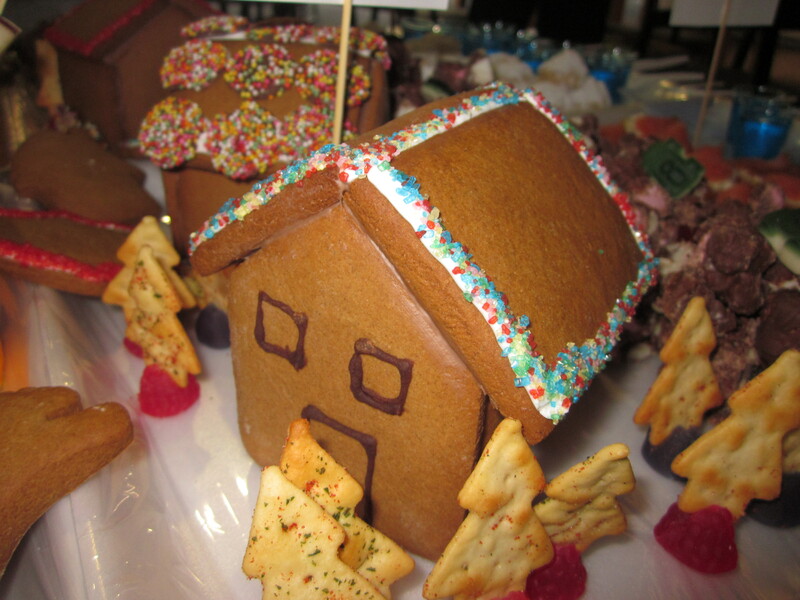 As part of my team’s display, and given I had just learnt how to make them in my baking classes, I offered to make gingerbread houses. Not one house though, oh no, I said I’d make multiple houses (I made 6 in total). 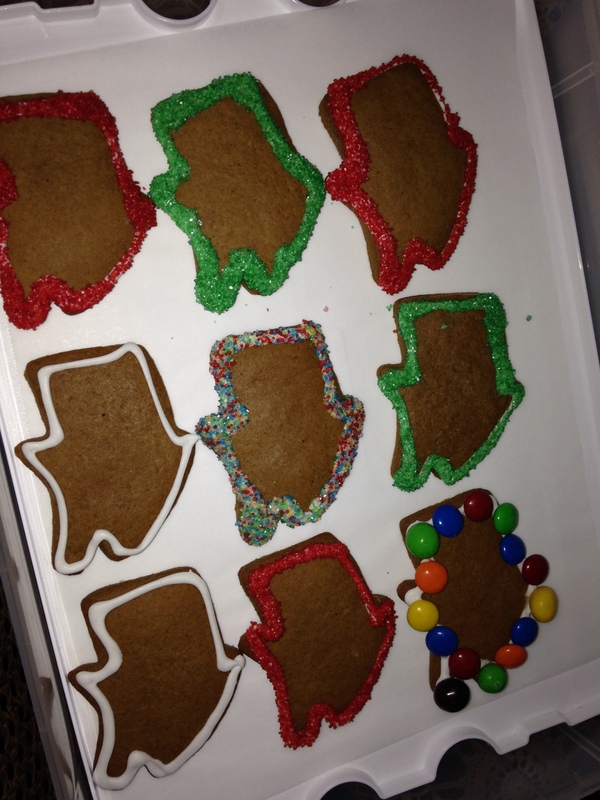 I also made gingerbread biscuits as well (about 50 individual biscuit houses, cars and trains). sorry for the angle of the photos! 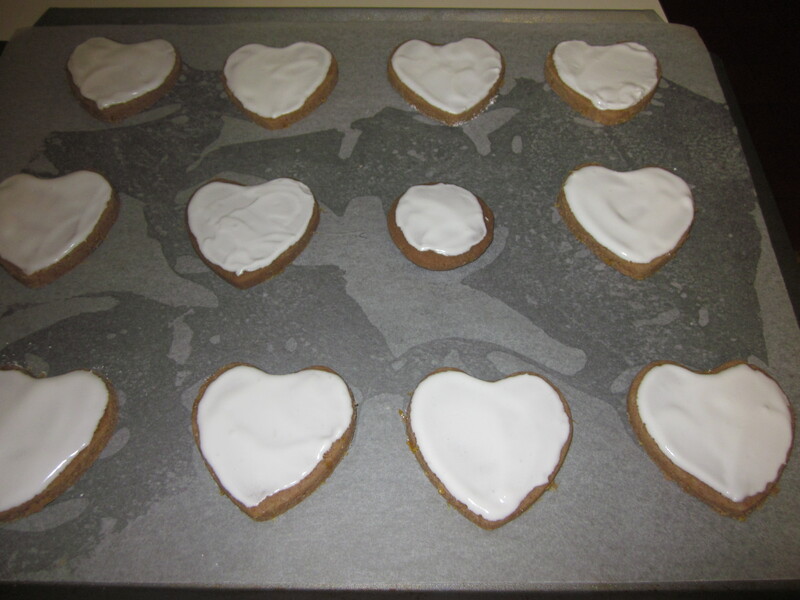 This gingerbread recipe from Sarah Brigden (babyCakes) is great and I would certainly recommend it. It can be made up to a week in advance before baking (just wrap it well in cling wrap and store in the fridge) or it can be frozen (very well wrapped in cling film and them placed inside a glad bag). Once cooked, it should last for a month. It has quite a lot of spice in it, however if you prefer you gingerbread lighter on the spice, you can easily reduce the amount. 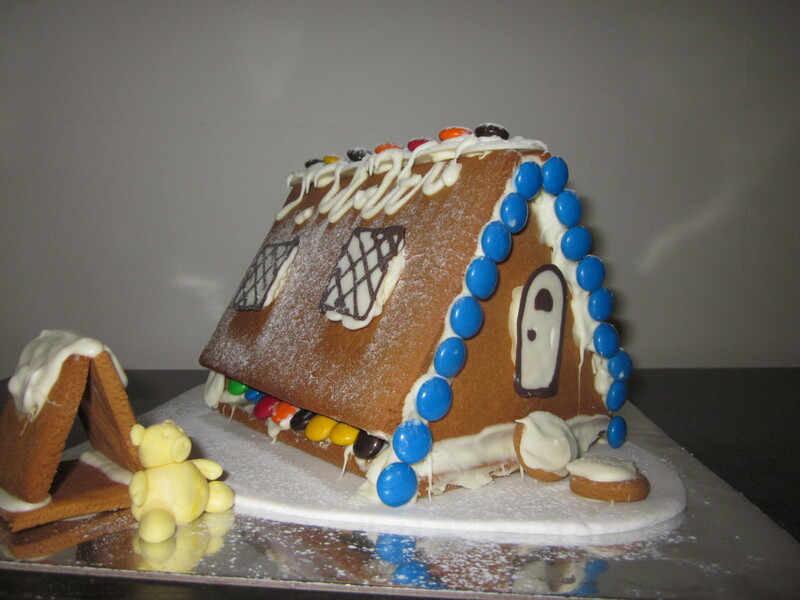 The gingerbread house is stuck together using melted chocolate. This is fine on a cool day/night. 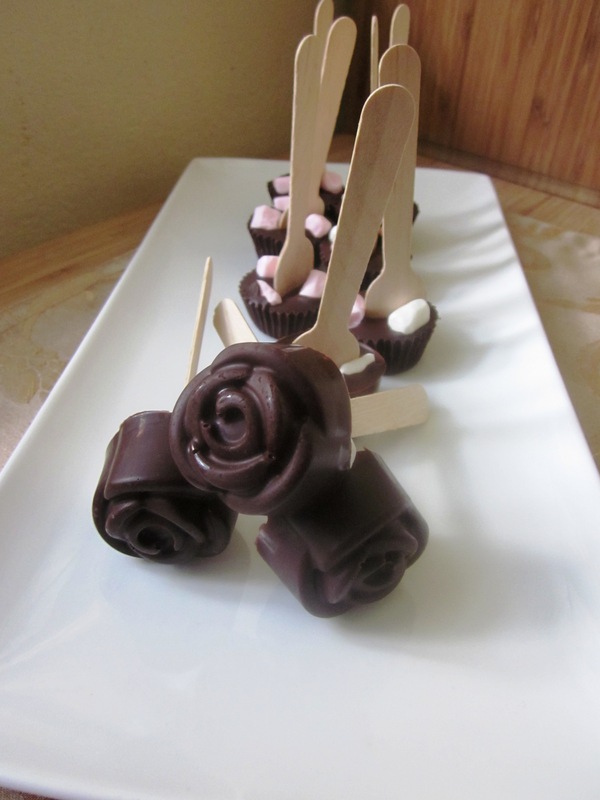 However the weekend I was assembling these, the temperature hit above 40C, which was not ideal for chocolate work. Add to that a migraine when I was trying to decorate, and it wasn’t a very enjoyable weekend of baking. The end result was worth it though, even with my migraine impaired/minimal decorating. These were WA Christmas houses, so no snow covered gingerbread houses in sight! 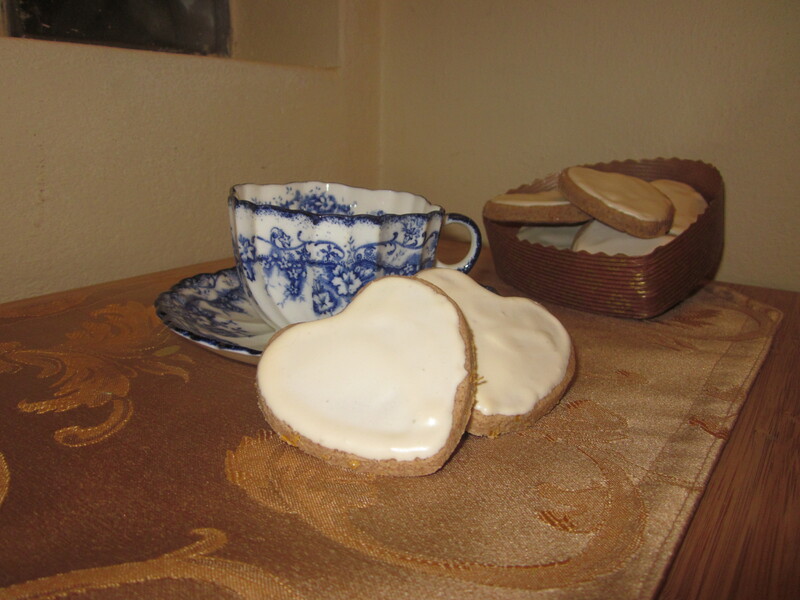 Everyone who tried the gingerbread loved the taste. 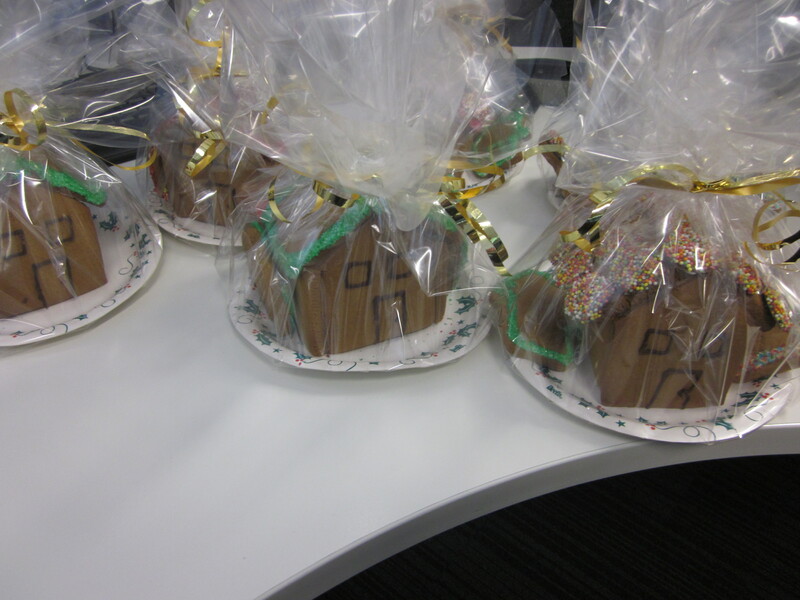 Once the morning tea was over, I wrapped up the houses and some biscuits in cellophane and gave them to my team to take home. They make a great Christmas gift idea. In class, we made an A frame house, as this is easier to assemble for a first time attempt. To make it, you will need to make a template rectangle of 150mm x 105mm (you will need to cut three pieces for each house – two sides and a base) and a triangle of 115mm x 115mm x 115mm (you will need two pieces for each house – front and back). For the smaller (and more detailed) houses, I used a template I found online here. For some I made the roof template slightly longer so I could assemble them differently so that the join didn’t show at the front. To do this I baked the roof pieces separately after I had assembled the base of the houses and determined how long I needed to make the roof. However, if you assemble them so you can see the joins at the front, you don’t need to do this.